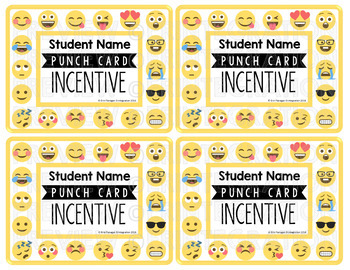 Emoji Punch cards for behavior, incentives, homework, prizes and more. Editable on Adobe and PowerPoint. 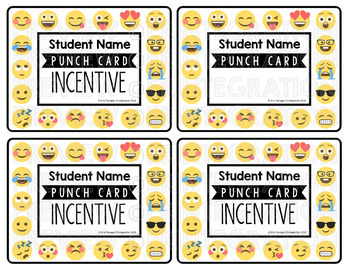 Type student names and the "prize," goal or earned item on the punch cards. Or print and write for a personalized look. Use a hole punch to punch an Emoji whenever students return homework, show expected behavior, pass an AR quiz, etc. You can also print onto full sheet label paper and make stickers each time you punch. 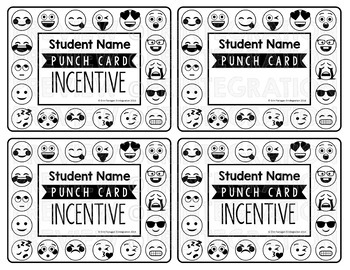 Or print the blackline punch cards and have students color an Emoji to keep track. 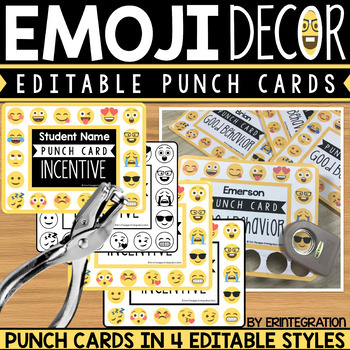 This editable Emoji punch card set comes in 4 styles. ★ 4 styles of punch cards in an Adobe editable PDF. ★ 4 styles of punch cards to edit on PowerPoint with your own fonts. Each punch card measures approximately 3x5 inches when printed.